I should be using expletives and exclamations entirely. Mike Manley, you are a criminal and a gitdim saint. Robbing all these people of their good pants, tsk tsk. Seriously, all 707 hp and all 645 lb-ft of torque? Serious?! I can still tow 7,200 lbs, AND my Jeep will look less suspicious than the blacked out 5.7L (let alone SRTs with the bumper DRLs) I see running around?! Plus some of these journos are saying it will be priced around $85,000?!! Ya’ll crazy!!! Someone is going to get hurt and I hope it’s me because I think I just got into that kind of thing. It makes 707 hp and 645 lb-ft of torque! The supercharger whines because it...because it doesn’t have time to form a complaint! The Earth screams for mercy every time you put your foot down. Meteorologist everywhere will always report a low pressure system coming in from Detriot. I’m hearing a 3.5 second 0-60 mph time and an 11.6 second quarter mile @ 116 mph. I’m hearing that the floor mats had to be welded to the frame to keep them from ending up against the rear glass. I’m hearing Jeep is going to charge you $8,000 for the full seats because you only need the edge! I’m sorry I had so little faith and expected this engine to be nerfed. I WAS THINKING OF THE CHILDREN!!! Real talk though, I’ll never be able to afford this rig because it will NEVER depreciate in value enough to end up under $80,000. That’s plain and simple. It’s too easy to make this thing sound logical for daily living. Baby strollers are only getting bigger. Snow and slush and all kindz of precipitation perpetually prevents people from participating in public progams and pleasures. Plus, all these teenagers are running around in Bentaygas and G65s trying to punk me! We gotta Man(ley) up and put our foot down! And honestly, I don’t think there is a better place to put your foot down. 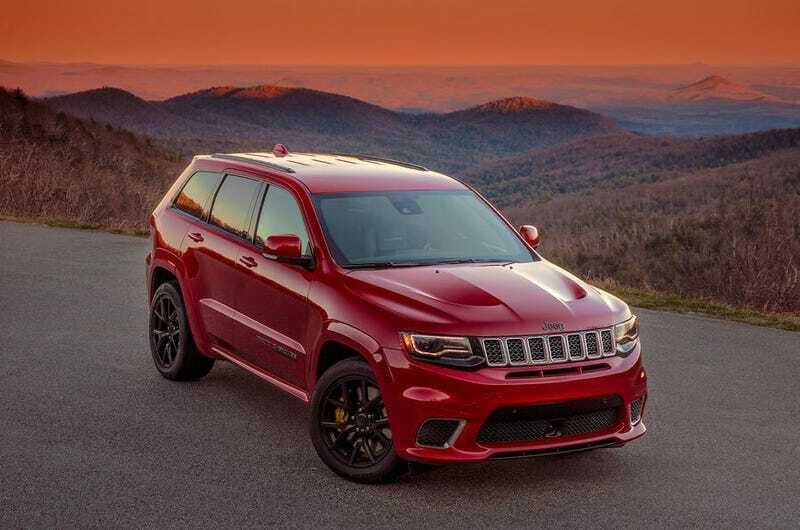 Congrats Jeep team, you showed off the WK2 at the New York Auto Show in 2009 touting the efficiency of the all new Pentastar V6, now you’re back again in 2017 with the same hauler showing off the 3-year old Hellcat engine. The Circle of Life.